Amazon Smile is a program that allows Amazon customers to support CORBA through their Amazon purchases. 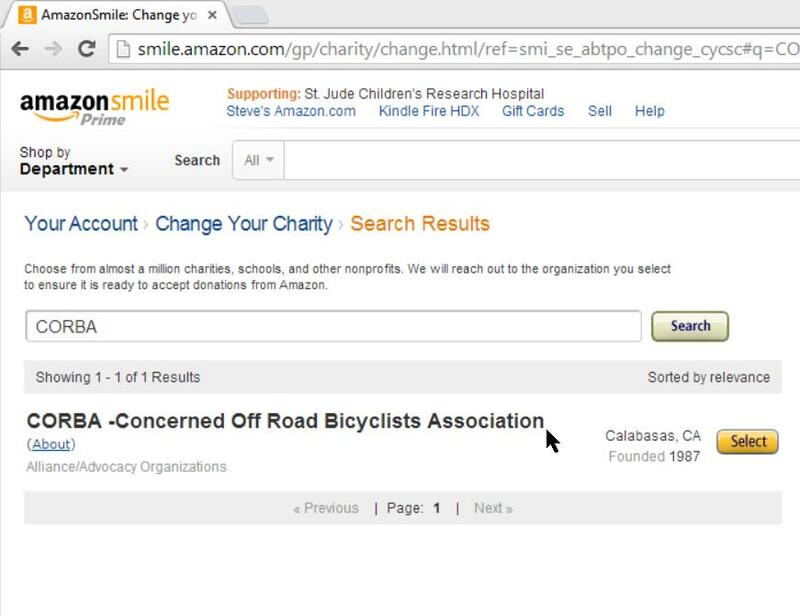 Once you designate CORBA as your non-profit charity of choice, .5% of all eligible purchases made through http://smile.amazon.com will go to CORBA. There’s no additional cost to you. You can still use your Amazon Prime to get free shipping and other benefits. It’s easy to set up. Go to http://smile.amazon.com/ch/95-4124454 to select CORBA as your beneficiary. Then bookmark http://smile.amazon.com and remember to start your shopping there. The funds raised will go to CORBA’s general fund, supporting our Youth, Advocacy and Outreach programs as well as our Volunteer Trail Crew. CORBA is volunteer-run, and all of the funds raised will go towards these programs. REI: Shop at REI using this link. Ralphs: Register your Ralphs Card with Ralphs Community Giving and designate CORBA using our “NPO” number 90320. This entry was posted on Monday, March 31st, 2014 at 2:51 pm and is filed under Special Announcement. You can follow any responses to this entry through the RSS 2.0 feed. You can leave a response, or trackback from your own site.